A weekend course covering the basic of wilderness living. Join us and learn about life in the wild, gain skills knowledge and confidence. A few of the photos from the photo shoot, looking good guys! We have a proper photographer joining us on Wednesday to take some awesome photos of us teaching wilderness living skills. Looking forward to meeting old friends who are joining us as clients for the day. Woods, friends and fun should be a good day. To all those who joined us in the woods last year a very happy new year. To those who haven't joined us, why not? get booked in now. We are hoping this year will be a significant one. 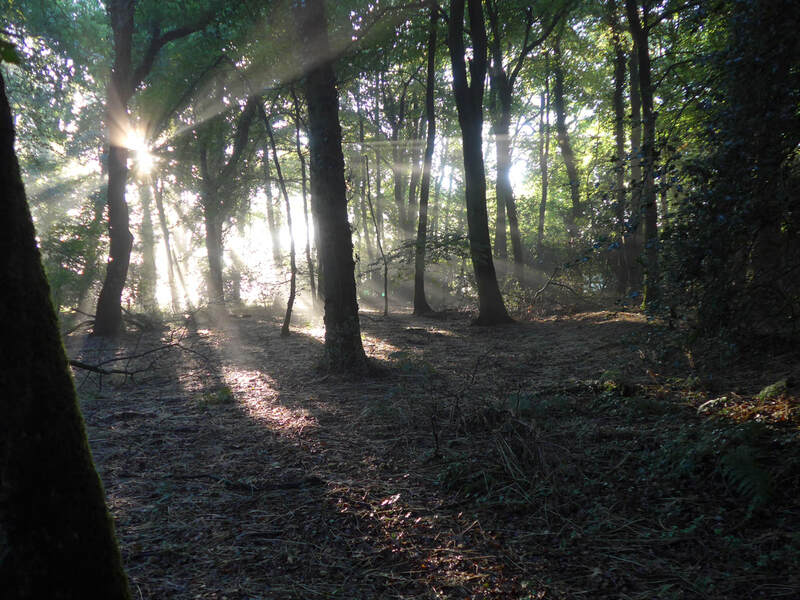 We are planning to do more in the woods and create lots of exciting opportunities for people to engage with the wild. 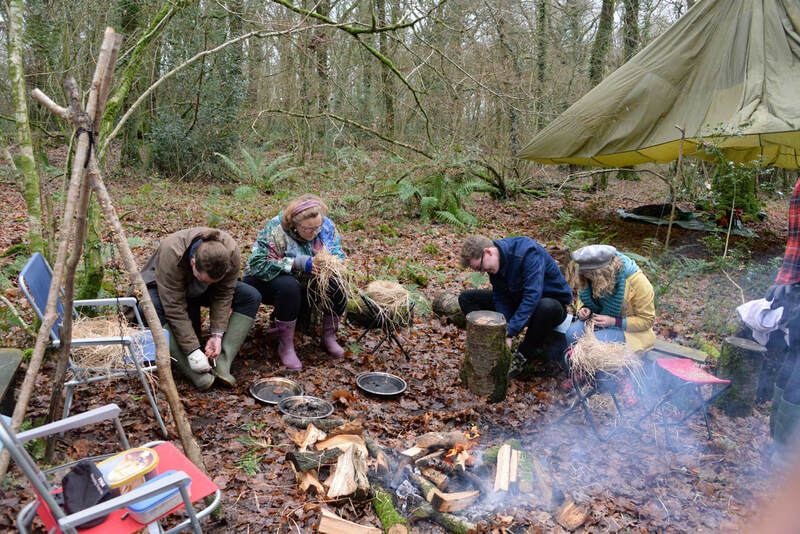 Is it time for you to book yourself onto a course with us and learn about wilderness living. We specialize in running courses that are designed around your group, all we need is a minimum of 3 to make it happen. Get in touch and talk to us about what it is your looking for. Why not buy someone a great experience in the woods. They will learn the vital skills for wilderness living, have a great time and go away with a new appreciation of the wonder of nature. We can provide vouchers, just get in touch and sort out a fantastic gift. Once more what a privilege to work with great people and help them gain a new skill. The day was dedicated to the bow drill a very skill that can raise the level of frustration to new heights. The groups determination to persevere and keep going was a credit to them, building that rare quality of quiet determination. The smoke eventually became embers, well done. We are here to create the best experience in the woods for you, get in touch and book a date with us. This is a skill that enables us to have confidence whatever the weather we can create a fire from scratch in the woods. 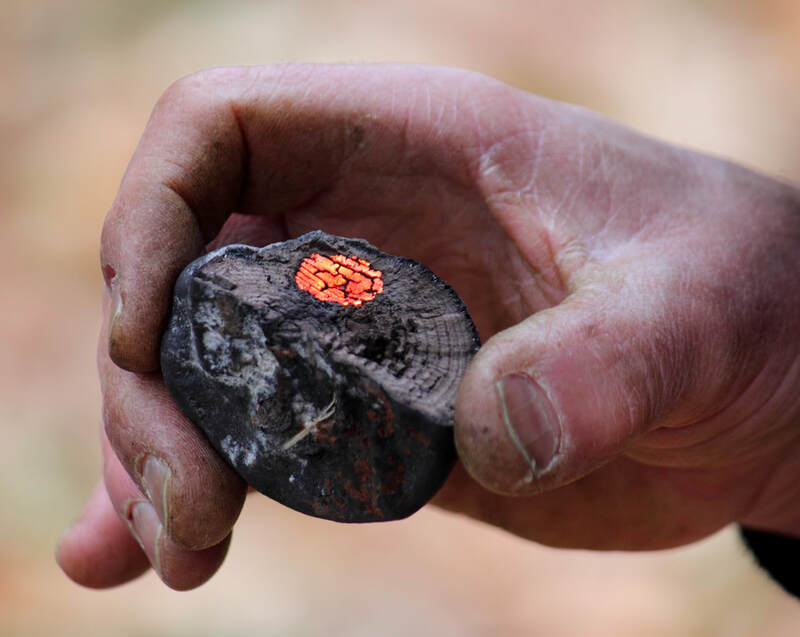 This day course will concentrate on the technique of using the bow drill, teaching you how to use a bow drill kit and create an ember. We will also teach you the woods that work and how to identify the trees. We will look at the condition of the wood and safe use of sharp tools to make your own kit. We have a few places left so get in touch ASAP and get booked in. For anyone who wants to learn the skill of creating an ember with a bow drill. From those who have never tried to those of you who want to perfect this skill, this day will have something to offer you. We will cover the technique of using the bow drill, identifying trees that you can use, sourcing the right condition of the wood and making your own kit. Come and join us and master this skill, you will go away confidant and with a huge smile on your face. Hazel drill, Lime hearth and lime cordage on the bow. A great start to September. ​and a group of keen folks ready to learn flint knapping. This is another of the flints I have found, I am sure its a scrapper. Made 1,000's of years ago by someone doing the best they could to survive. This is an age old skill and we are very fortunate to have a flint knapper run a training day for us. I am getting excited and it's great that we have 7 people signed up already. There are a few places left if your interested. Get in touch and find out about this great day. What could be better than a day in the woods in September learning such a cool skill? We have booked a full time flint knapping teacher and he will be leading the day. 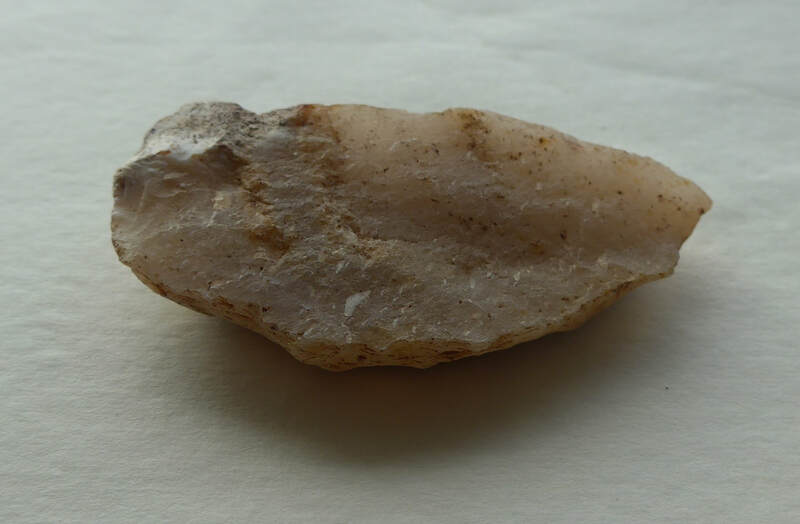 On the day you will learn all about flint tool making and make your own flint tools. it will be a great experience and we are doing this very close to a bronze age settlement where people did exactly the same for 1,000's of years. We have limited space and the course is filling up, so book ASAP. We are very excited about having a stand at this great show. Click the button on the right to find out what will be happening on the day. If your there come and find us we will have demos and displays about all things bush craft. We continue to deliver great days out in the woods, learning skills, discovering more about the woodland environment and having fun. Get in touch and see what we can do for you, from corporate team days to children's birthday parties. We will teach the skills needed to live in the wild, from an introduction through to specialised skill days. Learn what plant will calm the sting, how to turn plant fibres into cord, what plant not to eat and what plants you can eat. Discover the amazing array of trees and how they are so different to each other. Hurry book now! don't miss out on a day in the woods with us. It didn't feel like it on Saturday, it was a little damp and cold but that doesn't stop intrepid folks getting out and having a great day. Well done to the group who were a pleasure to teach for just getting on with it and giving it their all. The best part of teaching bushcraft is the amazing people you get to meet, well done guys I am glad you had fun and enjoyed it. Looking forward to running a day on Saturday. We still have some spaces, its not to late to sign up up and join in. Come and join us for a great day of learning in the woods, lots of fun. contact us ASAP. 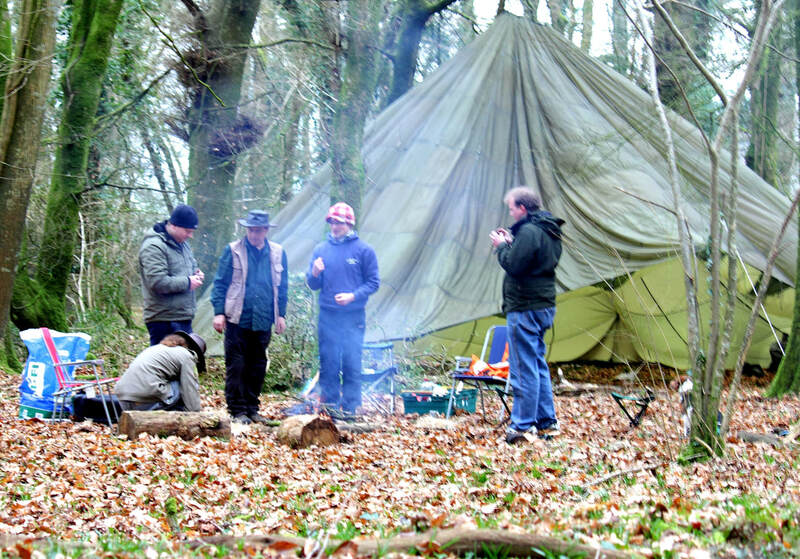 We have a day course running on Saturday March 24th at our woods near Tiverton. We have spaces left on this course so don't hesitate, get signed up for a great day learning new skills. Contact us for more info and details. The weather was a typical February day, overcast cold and damp, but what a good day we had. Mum and son, learning some bushcraft skills, it was mainly one to one with a great young man who now knows how to use an axe! We looked at staying safe with sharp tools and how versatile a good bushcraft knife can be. Fire lighting with sparks next, a little frustrating trying to ignite char cloth with a flint and steel, but perseverance paid off. We looked at sourcing water, some edible plants, amazing trees and then archery. A day in the woods learning skills, discovering some stuff your good at, gaining confidence and having fun. Not bad. Thanks guys you were brilliant. I really enjoyed the first bush craft day of the year. Working with a group of outdoor instructors. Despite it being a cold windy and damp January day they all did well and were great fun to teach. We are running a single day course that will focus on fire lighting and management. We will also do some archery and look at the woodland environment. 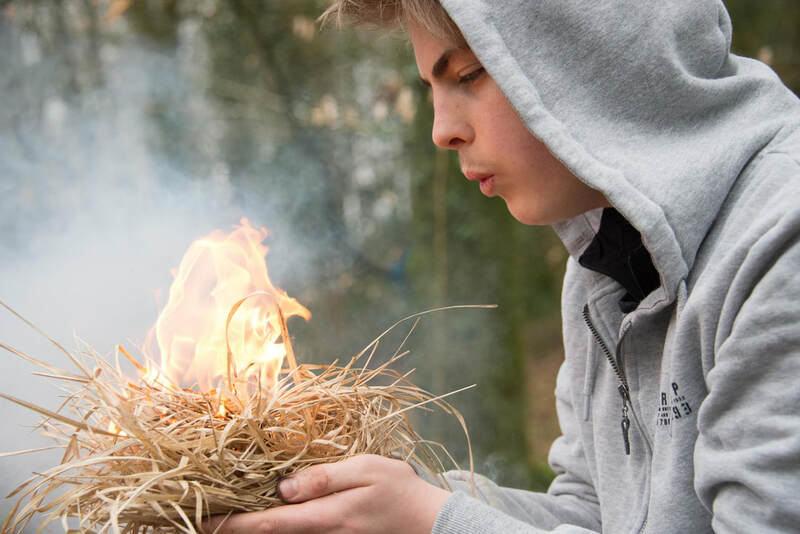 The ability to create fire is an essential skill, we can take you through this and give you the confidence to know you can light a fire with various methods. ​Sign up and have a great day with us learning in the woods.